HONG KONG—By day Mrs. Li, 52, works as a purchasing manager at a Chinese shipping firm. At night, she cleans toilets. “After work I come by at about 7 p.m. and clean them. Then once again at 10 p.m. I usually leave by midnight,” she said in an interview in Admiralty, Hong Kong’s government district which for the last month has been occupied by pro-democracy protesters. Her younger sister, Donna Huang, 50, sweeps up leaves and what little rubbish there is, for two to three hours, five days a week. The sisters are an example of the organic form of organization and voluntarism that has taken root in Hong Kong over the past month, particularly in the protest zone of Admiralty. Networks of individuals, connecting through social media, or sometimes not connecting at all (Li and Huang are part of no Facebook group from which they receive their sweeping orders), have come together to supply, guard, and groom the site. At its peak hours, usually on weekends, there are tens of thousands of people in the occupied zone, situated around the city’s government headquarters. During the week the permanent population probably hovers around just 1,000: sleeping, eating, and drinking, throwing away their rubbish and using the restrooms. They come and stay in an attempt to put pressure on the Hong Kong government, and the Chinese Communist Party, to allow citizens to stand for and participate in elections, free of the implicit political discrimination and filtering that now exists. For the thousands that trek through and live there, the site is, most of the time, a model of cleanliness. The toilets have been a hit on Twitter for being stocked with more products than a five star hotel; there is a recycling center; garbage is bagged and taken to drop-points for collection by the city trucks; volunteers make maps of where waste needs to be taken and sorted. Enthusiast scavengers have even set up their own recycling center. Qing Lam, 35, calls herself a “professional” scavenger and recycler. “This group are environmental freaks,” she explained, introducing the makeshift recycling, compost, and fly-trapping corner that she and her colleagues helped to establish. “This is a civic movement. It doesn’t need a leader,” she said, having rejected attempts by other groups at the site to integrate her and her team into a more established network. Her corner has piles of cardboard boxes, washed chopsticks (for the artists), a standing water filter retrieved from the dumpster at a trade show—according to Qing’s experience, the conclusion of trade shows is always the best time to get freebies, since it’s not worth the logistic expense to send back sample units. She keeps her corner in order, and takes trash and recycling out to a roundabout on Tim Mei Avenue, where it gets picked up by an NGO who then sells it, as well as the city garbage collection trucks. But no one seems to know who is behind the rest of the garbage system, or even if there is one. Volunteers acting spontaneously, or perhaps recruited in the most ad hoc of ways, seem to simply get the job done. A map showing where the trash collection points are. Mark Cheung, in his early 20s, was moving garbage bags and sorting broken umbrellas in mid-October, on the outskirts of the occupied zone. A spot nearby was reserved for the accumulated trash to be picked up by the city garbage collectors. 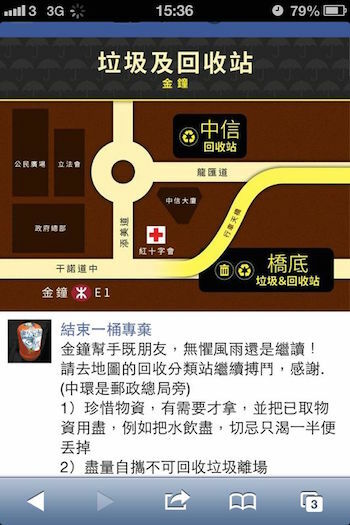 Cheung had been asked to help by a friend, who sent him a map on Facebook of where to go. When asked how he liked the job, he said: “Yeah, it’s not too bad,” the laconic remark matching the Australian accent he spoke in. Elaine Cheung, a 24-year-old videographer (and no relation to Mr. Cheung), had an even less organized entree into the world of toilet paper restocking. Apparently she took the day shift, before Mrs. Li arrives in the evening. Neither knows of the others’ existence. Cheung used hand soap one day, skin moisturizer the next, and finally the facial mask, all supplied in the bathroom. Hong Kong film superstar Chow Yun-fat has once again voiced his opinion about the Umbrella Movement.